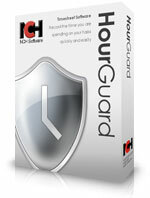 HourGuard makes it easy to track work hours with its simple-to-use interface. 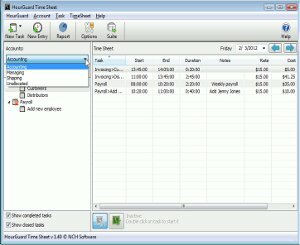 Click Start when you begin work, and Stop when you finish—the time tracking software does the rest for you, generating time sheets and even creating invoices for you. Free yourself to focus on work without worrying about logging your hours, and enjoy the flexibility to review your achievements after the fact. With detailed reports of the hours spent on designated tasks and sub-tasks, you’ll have a window into your workday that quietly runs in the background until you need it. Manage your business accounts with easy accounting software ideal for small businesses. Try FlexiServer productivity and attendance software for automatic employee attendance logging. Track all customer relationship information and interactions with Reflect CRM Customer Database. Manage project tasks, resources and timing with Express Project project management software.